Clockwise from top left: Terry Cusack, Gene Campbell, Rick Campbell and Noel Cusack. Terry Cusack and Gene Campbell had met when Gene was a member of a group called the Meteors, (not the same group as Max Merritt's). When that group folded they formed a new group called Gene and the Dynamites. They were fanatical Cliff Richard and the Shadows fans and named their group after one of their hits. The group was formed in 1959, based in Auckland they soon gathered a reputation for being a good dance outfit, supplementing their Cliff Richard and the Shadows repertoire with numbers by Buddy Holly, Elvis and the Everly Brothers. At the end of 1959 they became the resident band at a Sunday Night Teenage Club in Panmure, staying there for over a year. Red Williamson, Gene Campbell, Owen Campbell and Rick Campbell. In October 1961, Cliff Richard and the Shadows flew into New Zealand for a tour. Columbia Records hired Gene and the Dynamites to greet them at the airport and they got to hang out with their idols after their concert. The group gigged regularly around the dances in Auckland during 1961, with regular spots for each night of the week. At the end of 1961, both Terry and Noel Cusack left the group. They were replaced by Brian McCarthy on lead guitar and Red Williamson on drums. A fifth member was added to play rhythm guitar and assist on vocals. He was another Campbell named Danny. They continued playing dance halls and spent most of 1962 as the resident band at the Belair Coffee Lounge, opposite the Town Hall in Queen Street, where they played seven nights a week. Top Gene Campbell, l to r, Owen Campbell, Red Williamson, Rick Campbell and Brian McCarthy. In June 1963, Red left and was replaced by Ray Mulholland. 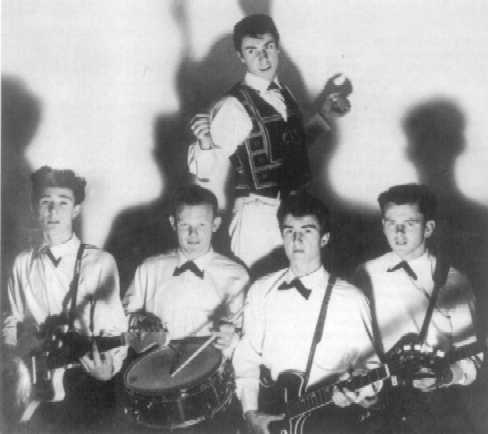 The group moved into a new residency at the newly opened Surf City in Karangahape Road and for a short time were known as Gene and the Surfboys. In 1964 they moved again to the Shiralee in Customs Street, but in April Gene left to start his own advertising agency. Gene and the Dynamites never recorded, but without Gene, they carried on, renaming themselves to the Seakers.